If you find yourself agreeing with the mission and intent of this website and you’d like to help in some way, there are several things you can do. Tell a friend about this site, especially Music Ministers, Worship Leader and Church Music Directors. Use one of the affiliate links that are set up below. A referral fee from these affiliate relationships help cover the cost of developing and maintaining this site. Mediatunes Inc. is providing the song on this website for use in your music ministry. Of course, hosting and development cost money. Keep in mind payment is not required… If you find any resources useful and would like to help, donations are encouraged and much appreciated. Wear your faith with this stylish tee-shirt. 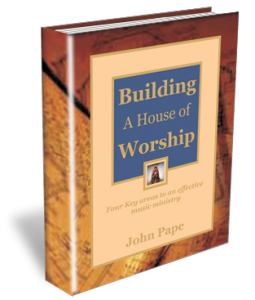 Revolutionary E-book and follow-up training for the contemporary worship ministry. Gives a firm theological foundation for worship leaders and worship musicians. Worship Leader magazine gives thought-provoking articles on issues relating to the practice of corporate and personal worship in the Christian community 8 times a year! With the Song DISCovery Program, your 8 issue subscription includes 6 CD resources and lead sheets of the best of today’s contemporary worship songs. Subscribe today!